Two years later, on March 31, 1991, Georgians voted overwhelmingly in favor of independence and on April 9 of that year, the Supreme Council of the Republic of Georgia proclaimed Georgian sovereignty and independence from the Soviet Union. Today, April 9th is a public holiday and is remembered as Day of National Unity in Georgia. So this was one year ago: I had come to Tbilisi with a bag full of working prints and a head full of ideas – which I brought to the studio of book designer Otar Karalashvili. In the following weeks we would discuss, edit, design, fight, you know, just the usual stuff it takes when you’re making a book. But then, at the end of my first stay in 2018, we knew where this was supposed to go, how all the works would come together – to become Tamar, Where Are You?. Remember the earlier days of the internet and web cams? There was the coffee cam, a camera set up at the University of Cambridge, England, which was the inspiration to the world’s first web cam. When I was in Georgia working on our book project, for several times I had the opportunity to stay in the studio of a friend, the amazing painter Alex Berdysheff. There, one of my morning routines was to make some toast and coffee or tea, which I would then enjoy up on the the roof where there was a beautiful balcony. It was only later that I would find out that this was a fairly common Tbilisi experience because this or similar kettle models would be featured in quite a number of Tbilisi households. Great way to end the year for us … „Tamar, Where Are You?“ is introduced today on the German blog Read Ost – saying it provides an introduction to contemporary Georgian photography. Thank you. The German magazine Ost Journal is an ambitious project covering issues around Eastern Europe. And the current issue 2018-04 features our book „Tamar, Where Are You?“ … – with a very nice spread including works from almost all of our participating photographers. In addition they published an interview on their website … thank you for the opportunity to introduce our project to their audiences. What a wonderful recognition: „Tamar, Where Are You?“ was awarded Bronze Medal at the German Photobook Award 18I19 in the category self-publishing. The photographers Dina Oganova, Giorgi Shengelia, Guram Tsibakhashvili, Natela Grigalashvili, Tinatin Kiguradze, Vakho Khetaguri and Yuri Mechitov. The authors Ana Kordzaia-Samadashvili, Dato Turashvili and Giorgi Tabliashvili – including the translators Sybilla Heinze (German) and Natalia Buka-Peters and Charlotte Marsden (English). The book designer Otar Karalashvili. And last but not least the Georgian National Book Center and all our other supporters, who so graciously helped us make this book happen. 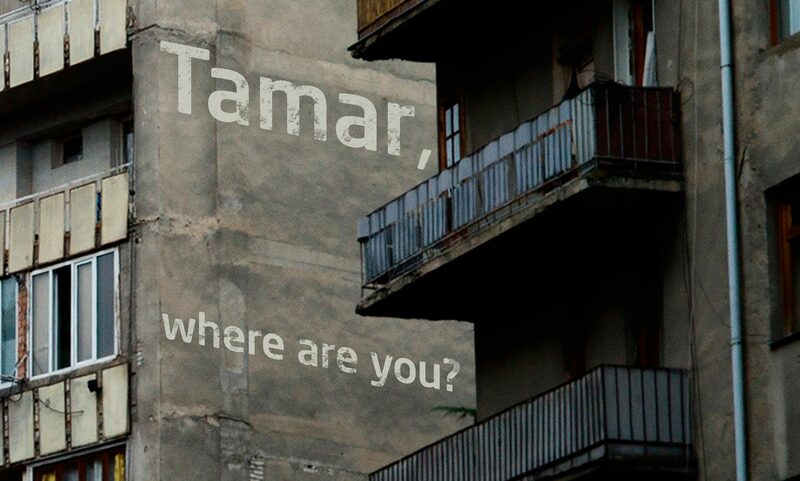 So we finished the first round of presentations of our book „Tamar, Where Are You?“. We were able to show and talk about our book in Aarhus, Denmark, in Frankfurt, Berlin, Kiel and in Hamburg – and all there’s left to do now is to say thank you. Photobook Week Aarhus, Georgian National Book Center, Georgian National Book Center with the Georgian Pavillon at the Frankfurt Bookfair, Embassy of Georgia to the Federal Republic of Germany, bookshop Almut Schmidt in Kiel and the bookshop Sautter + Lackmann in Hamburg. But even more so to everyone who came, listened, asked questions, discussed the book and Georgia with us. We really had a great time and appreciate all the good feedback we received so far. Tamar geht auf Tour … . Wir freuen uns sehr über das positive Feedback, das wir zu unserem Buch „Tamar, Where Are You?“ erhalten – und ganz besonders über die Einladungen, unser Buch auf verschiedenen Events vorstellen zu können. Wir haben schon eine Reihe Termine, angefangen in gut einem Monat auf einem Fotobuch-Festival in Aarhus, Dänemark, über die Frankfurter Buchmesse, dann Hamburg, Berlin und Kiel. Infos zu den bisherigen Terminen findet Ihr hier, aber ich bin mir sicher, das ist noch nicht das Ende. Sobald es also Neuigkeiten gibt … hier gibts die Details. Und wenn Ihr eine Idee habt, wo wir das Projekt noch vorstellen könnten – oder aber einen Buchladen, eine Galerie oder Ähnliches, dann freuen wir uns darauf, von Euch zu hören. Tamar is coming to a place near you … . We are very happy about all the positive feedback we’re receiving for our book „Tamar, Where Are You?“ – and especially the invitations to present our book. There’s already a good number of events lined up, starting in about a month at a photobook festival in Aarhus, Denmark, going via the Frankfurt Book Fair, Hamburg and Berlin to Kiel. For all the details, please have a look here. But I’m pretty sure, this won’t be the final list, so as soon as there’s more … this is the place where you’ll find out about it. And in case you have an idea where we should go next or if you have a book store, gallery or any other place and would like to us to present our project, we would love to hear from you. One week ago, our book „Tamar, Where Are You?“ was delivered – and since, we’ve been busy keeping up with the orders. Thanks to everyone who wrote, called or mailed us – we absolutely enjoyed the interactions with everyone so far and are making sure, you receive the books in the most timely manner. And just in case you haven’t made up your mind, have a look here – it’s where you’ll find the book … and so much more.